Mutilated to be acceptable in Cold War America. Five excellent Soviet Block films. In 1960, 1961, 1962 and 1964 I saw five motion pictures that I enjoyed very much. I would discover two things about each of the five. The first was that they all came from Soviet Block Countries and with "The Cold War" at its height. This made each motion picture very interesting both aesthetically and need I say politically. The second thing I learned was that each of the American distributors tampered with the original foreign release which had been made years earlier. The tampering with the original cut of foreign films was a problem I was already experiencing with Japanese science fiction and horror movies. A prime example being the 1955 Toho production "Jujin Yuki Otoko (Monster Snowman)". The original picture which I was to see at the Nuart Theater in Santa Monica, California, one of my favorite hunts in the late 1950's and early 1960's, had a running time of 98 minutes. The Distribution Corporation of America would re-edited Ishiro Honda's classic horror and morality tale for United States release. They added approximately 35 minutes of footage with actors John Carradine, Russell Thornson, Robert Karnes and Morris Ankrum discussing the bare bones plot left in the Japanese footage used. This reworked version was released re-titled as "Half-Human", All the Japanese music was replaced and not one word of the original Japanese dialogue was kept. All non-English dialogue had been replaced with voice over narration by John Carradine. Upon it's release in September 1958 "Half Human" had a running time including all the newly shot American footage of only 63 minutes. This meant that only 28 minutes of "Half Human" contained the original film footage from "Jujin Yuki Otoko" minus its sound. 70 full minutes of that beautifully shot and edited Japanese motion picture was ignored. Changing a foreign film's narrative to fit the cultural perceptions of the country it will be shown in does make sense in certain instances. Let me illustrate this point again with Japan and Toho Studios. The classic example is found in a motion picture that was released in Japan, Asia and to West Coast Asian movie houses the year prior to "Jujin Yuki Otoko". This Science Fiction classic was also directed by Ishiro Honda. The picture was 1954's "Gojira" and although the American Distributors wanted to subtitle the film as shot. They faced a very strong anti-American sentiment in the dialogue which was expressed through the allegory of it's title character, The producer Tomoyuki Tanaka made a deliberate statement about President Truman's decision to drop two atomic bombs on the Japanese cities of Hiroshima and Nagasaki. A decision which forced Japan's surrender, but caused horrendous death and illness to the people of Japan that American scientists had not expected from the nuclear detonations. With the Second World War having only ended in 1946 eight years before "Gojira" was made. Anti-Japanese sentiment still existed in the United States and would carry on for several more years. The solution came in 1956 when the film was basically re-edited into a typical 1950's monster on the loose story told through the narrative eyes of American International News Reporter Steve Martin. The new English language title to this re-edit was "Godzilla, King of the Monsters". A motion picture that even with the added scenes of actor Raymond Burr as Steve Martin still ran 17 minutes shorter than the original to avoid political problems. There are many great Soviet Block motion pictures and several over the years in Science Fiction such as Adrei Tarkovsky's 1972 "Solaris". There are even great forgotten silent films that rival even the work of German film maker Fritz Lang. One is Yakov Protazanov's 1924 "Aleita, Queen of Mars" I could write a book on the subject and there are a lot already out there, but I am taking you back to my early teen years with just five on my favorites and in four case the influence of the "Cold War" and in one also adding the effect of religious beliefs in the United States in the 1960's. In 1960 I saw a very exciting, at least to me, motion picture with a three headed dragon, a giant, an ogre and other elements that made a 14 year old very happy. That movie was the English language version of a film made in the Russia and I will get to it shortly. However, I wish to begin with the original 1956 Russian production that English language version was derived from entitled "Ilya Muromets" directed by Alekeandr Ptushko. Who I would discover also directed two more of the five films I enjoyed. The motion picture was made by the prestigious Mosfilm Studios and released in 1956. From a strictly technical point the film was the first Soviet motion picture to use the CinemaScope process. Directly below is the Russian poster followed by the Romanian. Although this was a Fantasy motion picture with a Dragon and other legendary characters. The story goes back centuries and is based upon the life of the real Ilya Muromets of Russian Folklore. The following is taken from a posting on the website "The Voice of Russia Radio" found at <sputniknews.com>. On January 1, the Russian Orthodox Church pays tribute to Reverend Ilya Muromets. Although Ilya's adventures are mostly a matter of epic fiction, he himself is believed to have been a historical person. A 13th century warrior, he is beatified as a minor Saint of the Russian Orthodox Church. His remains are found and stored in Kiev Pechersk Lavra. Legend has it that Ilya was born in the village of Karacharovo, near the ancient Russian city of Murom. He was then allegedly given super-human strength to protect the city of Kiev from enemies in what was endorsed by Prince Vladimir. Ilya Muromets is rightly regarded as the greatest of all the legendary bogatyri, or medieval knights-errant of Kievan Rus. His relics are found and stored in Kiev Pechersk Lavra, something that the Church says indicates the very fact of existence of Ilya Muromets. It is generally believed that Muromets's prototype was St. Ilya Pechorsky, a minor saint of Orthodox Church, beatified in the 17th century. The basis of the legend of Ilya Muromets can be found in several "Bylina's", or "Starina's". Which are both names given to East Slavic Epic Poems appearing first in the 10th Century. These are similar in structure to the works of Homer's "The Odyssey", or "The Iliad". The following is a translation of one of the poems about Muromets sailing on a "Falcon Ship". In the hamlet of Karacharof, by Murom town, dwelt Ilya the Old Kazák. Thirty years he sat upon the oven, having use of neither arms nor legs, because of his grandfather's sin. And when thirty years were past, in summer, at the time of haying, his father and mother went forth to clear the forest-girdled meadows, and left Ilya alone in the cottage. Then there came to him three wayfarers-Christ and two of his apostles, in the guise of poor brethren, strolling psalm-singers, and besought him that he would give them to drink. "Alas! ye wayfarers, good men, dear friends!" said Ilya; "full gladly would I give you to drink: but I cannot rise, and there is none in the cottage with me." Drink now after us, Ilya, son of Ivan." When he had drunk, the old men said: "How is thy strength now, Ilya ? " Ilya answered: "I thank you humbly, ye aged men. I feel a very great strength within me, so that I could even move the earth." Then the men looked each upon the other, and said: "Give us to drink yet again." And Ilya did so. And when they had drunk, they gave the cup to him the second time, and inquired: "How is it with thee now, Ilya? " "The strength I feel is very great," said Ilya, yet but as half the former strength." "Thus let it be," spoke the men: "for if we give thee more, mother earth will not bear thee up." And they said: "Go forth now, Ilya." "God hath blessed thee, Ilya, with this strength of His. Therefore, defend thou the Christian faith, fight against all infidel hosts, bold warriors and daring heroes, for it is written that death shall not come to thee in battle. Stronger than thee there is none in the white world, save only Volgi, (and he will take thee not by might but by craft), and Svyatogor, and, stronger yet, beloved of damp mother earth, Mikula Selyaninovich, the Villager's Son. Against these three contend thou not. Live not at home,-labour not; but go thou to royal Kief town." And therewith the men vanished. Then Ilya went forth to his father, in the clearing, and found him with his wife and labourers reposing from their toil. He grasped their axes and began to hew; and what his father with the labourers could not have done in three days, that Ilya achieved in the space of one hour. Having thus felled a whole field of timber, he drove the axes deep into a stump, whence no man could draw them. When his father with wife and labourers woke, and beheld the axes, they marvelled, saying: "Who hath done this? "Then came Ilya from the forest, and drew the axes from the stump; and his father gave thanks to God that his son should be so famous a workman. But Ilya strode far over the open plain; and as he went, he beheld a peasant leading a shaggy brown foal, the first he had seen. What the peasant demanded for the foal, that Ilya paid. For the space of three months, he tied the foal in the stall, feeding it with the finest white Turkish wheat, and watering it from the pure spring. After these months were past, he bound the foal for three nights in the garden, anointing it with three dews. When that was done, he led the foal to the lofty paling, and the good brown began to leap from side to side, and was able to sustain Ilya's vast weight; for he had become a heroic steed. All this Ilya did according to the commands of the aged psalm-singers who bad healed him. Then Ilya saddled his good steed Cloudfall, prostrated himself, and received the farewell blessing of father and mother, and rode forth far over the open plain. "Ho there, Ilya of Murom! Thou sleepest there and takest thine ease, and knowest not the ill fortune that hangeth over thee. Hero Svyatogor cometh to this his pavilion. Loose me now, in the open plain, and climb thou upon the damp oak." Then sprang Ilya to his nimble feet, loosed his horse and climbed into the damp oak. And lo! a hero approached; taller than the standing woods was he, and his head rested upon the flying clouds. Upon his shoulder he bare a casket of crystal, which, when he was come to the oak, he set upon the ground and opened with a golden key. Out of it stepped his heroic wife; in all the white world, no such beauty was ever seen or heard of; lofty was her stature and dainty her walk; her eyes were as those of the clear falcon, her brows of blackest sable, and her white body was beyond compare. When she was come forth from the crystal casket, she placed a table, laid a fair cloth thereon and set sugar viands; and from the casket, she also drew forth mead for drink. So they feasted and made merry. And when Svyatogor had well eaten, he went into the pavilion and fell asleep. But his fair heroic wife roamed about the open plain, and so walking, espied Ilya upon the damp oak. "Come down now, thou good and stately youth," she cried: "descend from that damp oak, else will I waken Hero Svyatogor and make great complaint of thy discourtesy to me." Ilya could not contend against the woman, and so slipped down from the oak as she had commanded. And after a space, that fair heroic woman took Ilya and put him in her husband's deep pocket, and roused the hero from his heavy sleep. Then Svyatogor put his wife in the crystal casket again, locked it with his golden key, mounted his good steed, and rode his way to the Holy Mountains. "Hitherto I have borne the hero and his heroic wife; but now I bear the heroic woman and two heroes. Is it a marvel that I stumble? " Thereupon Hero Svyatogor drew Ilya from his deep pocket, and began to question him:-who he was and how he came in the pocket. And Ilya told him all the truth. When he heard it, Svyatogor slew his faithless heroic wife; but with Ilya he exchanged crosses, and called him his younger brother. And as they talked together, Ilya said: "Full gladly would I see Svyatogor that great hero; but he rideth not now upon damp mother earth, nor appeareth among our company of heroes." "I am he," quoth Svyatogor. "Gladly would I ride among you, but damp mother earth would not bear me up. And furthermore, I may not ride in Holy Russia, but only on the lofty hills, and steep precipices. Let us now ride among the crags, and come thou to the Holy Mountains with me." Thus they rode long together, diverting themselves; and Svyatogor taught Ilya all heroic customs and traditions. On the way, Svyatogor said to Ilya: "When we shall come to my dwelling, and I shall lead thee to my father, heat a bit of iron, but give him not thy hand." "Ai, my dear child! Hast thou been far afield? " "I have been in Holy Russia, father." "What hast thou seen and heard there? "Bring hither the Russian hero, that I may greet him." In the meanwhile, Ilya had heated the bit of iron, and when he came to give the old man his hand in greeting, he gave him, in place of it, the iron. And when the old man grasped it in his mighty hands, he said: "Stout are thy hands, Ilya! A most mighty warrior art thou! " Thereafter, as Svyatogor and his younger brother Ilya journeyed among the Holy Mountains, they found a great coffin in the way; and upon the coffin was this writing: "This coffin shall fit him who is destined to lie in it." "The coffin was destined for me; take the lid now, Ilya, and cover me." Ilya made answer: "I will not take the lid, elder brother, neither will I cover thee. Lo! this is no small jest that thou makest, preparing to entomb thyself." Then the hero himself took the lid, and covered his coffin with it. But when he would have raised it again, he could not, though he strove and strained mightily; and he spoke to Ilya: "A!, younger brother! 'Tis plain my fate hath sought me out. I cannot raise the lid; do thou try now to lift it." "I stifle, younger brother! essay yet one more blow upon the lid, with my huge sword." "I die, oh, younger brother! Bend down now to the crevice. Yet once again will I breathe upon thee, and give thee all my vast strength." But Ilya made answer: "My strength sufficeth me, elder brother; had I more, the earth could not bear me." "Thou hast done well, younger brother," said Svyatogor, "in that thou hast not obeyed my last behest. I should have breathed upon thee the breath of death, and thou wouldst have lain dead beside me. But now, farewell. Possess thou my great battle sword, but bind my good heroic steed to my coffin; none save Svyatogor may possess that horse." Then a dying breath fluttered through the crevice. Ilya took leave of Hero Svyatogor, bound the good heroic steed to the coffin, girt the great battle sword about his waist, and rode forth into the open plain. And Svyatogor's burning tears flow through the coffin evermore. Should my reader want to read more of these poems and the entire article the above was taken from. Here is the link to the webpage and note that a picture of actor Boris Andreyev as Muromets from the 1956 motion picture is used. В главных ролях: Абрикосов Андрей, Андреев Борис, Арепина Ия, Мартинсон Сергей, Медведева Наталья, Морозов Николай, Мышкова Нинель, Пуговкин Михаил, Соловьев Василий, Шварин А. Starring: Abrikosov Andrey , Andreev Boris , Arepina Oia , Martinson Sergey , Medvedev Natalia , Morozov Nikolai , Myshkova Ninel , Pugovkin Michael , Soloviev Vasily , Shvarin A. Bringing to the motion picture screen the epic story of one of Russia's Folk hero's was a major production of Mosfilm Studios. What may seem callous is that only three years before this picture's release it would have been impossible to film it as written. What had changed was simply that Joseph Stalin had died on March 5, 1953 and Nikita Krushchev had come to power. Soviet movie studio's were given a small amount of breathing space by not having to make only movies with "socialist realism" at their center. . It is obvious that the original motion picture had a large cultural significance to the Russian people and their neighboring countries within the Soviet Block. So in a lot of ways it is sad what happened four years later in November 1960 when an American distribution company "Valiant" got hold of "Ilya Muromets" and the film became "The Sword and the Dragon" and for political reasons all reference to Russia were dropped. The "Sword and the Dragon" was no longer the saga of a legendary Russian folk hero, but just another typical fantasy adventure film . Like the aforementioned "Gojira" loosing its original purpose to become "Godzilla, King of the Monsters". 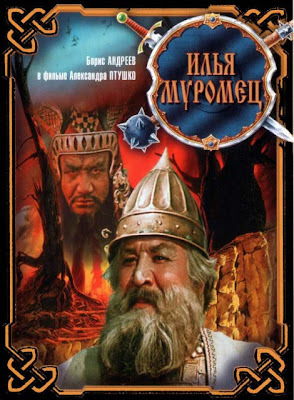 "Ilya Muromets" became a movie about a man hired to fight a dragon and other creatures to protect a Kingdom. Valiant had hired Roger Corman's company "Film Group" to re-edit the Soviet film for American distribution. "Film Group" was formed in 1959 by Roger and his brother Gene to permit Roger Corman to make his own movies. The Soviet version opens with minstrels meeting the giant (in this case quite literally) and ancient hero Svyatogor in the mountains. The minstrels tell Svyatogor that there is much trouble in the land and implore him to return and help. Svyatogor tells them that his time has passed. Svyatogor then gives the minstrels his sword to pass on to a younger hero. Svyatogor then turns to stone. Thus the ancient hero retreats into myth. The scene then shifts to the village of Karacharovo where we find young Ilya Muroments. As one of the villagers puts it, “The Lord gave him the build of a giant, but confined him to sitting like a bump on a log.” That is, he has a bear-like body (but is not a giant in the literal sense like Svyatogor), yet is a paralytic. Muromets can do nothing when a band Tugars (i.e. Tartars or Mongols) begins ransacking the village. The village only survives because a nearby caravan heavy with gold distracts the raiders. Roger Corman not only restructured the picture moving sections into different orders and removing others, but he also added that voice over narration by Mike Wallace the future host of CBS' "60 Minutes". The script was of course changed and through dubbing all references to Russia were removed. Corman went on to change many of the Russian character's names as the about quote mentioned. Which also removed any connection to the Folk Legend of Ilya Muromets. When completed the "Sword and the Dragon" was 7 minutes shorter than the original Russian picture and was now acceptable for the American viewing public. The television series "Mystery Science Theater 3000" poked fun at the Roger Corman re-edit, but to add insult to injury towards the original Mosfilm Russian production. The writers of MST3K" somehow got it into their heads that the film was made in Finland and filled their program with Finish jokes. A popular merchandising tool was to turn motion pictures into Comic Books by "Dell". I had this one years ago when the movie was released. As of this writing YouTube has a badly faded copy "The Sword and the Dragon" available for viewing. In 1958 the Soviet Union released "Ilya Muromets" on tape for home viewing. Today you can purchase an all region Russian DVD from the studio Russico of the complete Mosfilm picture, but the information and the case indicate the film was made in 1958 and not 1956. A little aside to the story of Ilya Muromets and re-enforcing how much his name means to the Russian people. During World War One the aircraft manufacturer Sikorsky made the S-22 and S-23. The first was a four engine commercial plane and the second a four engine bomber. The S-22 and S-23 were named for the folk hero Ilya Muromets. In 1958 directed by Karl Zeman a motion picture fantasy/adventure was released by Ceskoslovensky Statini Film in Czechoslovakia. Zeman for this picture and others he would make became known to the world as the "Czech Melies", because of his innovative films and his love of Jules Verne. Karl Zeman loved the look of the illustrations in the original Verne novels Below are two examples one from "Twenty-thousand Leagues Under the Sea" and one from "Around the Moon". Karl Zeman's goal was to recreate the look of these illustrations on screen in a motion picture. The result was "Vynalez zjazy" which would go on to win world wide acclaim starting with the "Gran Prix" award at the 1958 International Film Festival in Brussels. Followed by a "Silver Sombrero" in Guadalajara, A Czechoslovak Film Credits Award, A "Crystal Star" from the French Academy of Film and many others prior to its official arrival in the United States in 1961. I would see the film in it's original language and title with subtitles at the Nuart Theater in 1959. Many foreign films arrived at what were known as "Art House Theaters" in Los Angeles years before they were purchased by American film distributors. Here are some scenes from the motion picture. The first is suggestive of "Twenty-thousand Leagues Under the Sea". The last is from the novel "Robur the Conqueror" of his flying ship "The Albatross". The main Jules Verne story used for the movie was "Facing the Flag" from 1896 about a "Super Weapon" that could destroy the entire world. There are lifts from other works as the above scenes indicate. The film is a great ride and a must for any true fan of either Science Fiction, Jules Verne, or movie making in general. In 1961 promoter and producer Joseph E. Levine acquired the rights to "Vynalez zjazy". Levine was one of the producers for the 1956 re-edit of "Gojira" and had created the tag line "King of the Monsters". Levine had taken an unknown Italian film "Le fatiche di Ercole (Labors of Hercules)" from 1958 and in 1959 dubbed the movie into English. Joseph E. Levine renamed it simply "Hercules" and made a International Star out of Steve Reeves. As a result Levine created the "Sword and Sandal" craze in this country which lasted until "A Fistful of Dollars" arrived to bring back the American Western, if even Italian style. Levine took Karl Zeman's motion picture and made some changes to it. He added an introductory segment hosted by television personality Hugh Downs, This was patterned after what Michael Todd had done with Edward R. Murrow for his 1956 "Around the World in 80 Days". Next Levine decided that the names of the actual actors might confuse American audiences and so he changed some of them. Lubor Tokos was now Louis Tock, Arnost Navatril became Ernest Navara and Miloslav Holub was now Milo Holl. 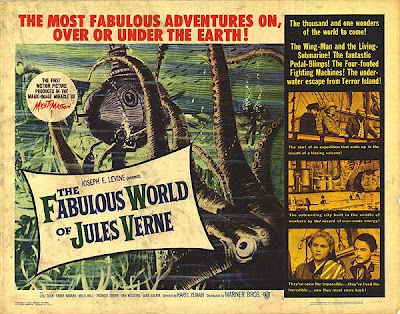 As for the title the movie became "The Fabulous World of Jules Verne" and Warner Brothers aimed its release at children on a double bill with a dubbed German Circus picture "Bimbo the Great". I could not locate anything about the circus picture, but I vaguely remember seeing it at the Majestic Theater in Santa Monica. Neither Levine, or Warner Brothers apparently had any idea that Karl Zeman's award winning motion picture was for adults also. Another example of the thinking of American studios at the time. This gem is available on an all regions DVD from the Czech Republic. In 1952 Aleksandr Ptushko directed a motion picture based upon an epic bylina that had been turned into an Opera about the sea captain Sadko. According to the legend he sailed from the old Russian city of Novogord. The city was the capital of the 12th to 15th century Novogord Republic and prior to 882 A.D. had been the capital of Russia until it was transferred to Kiev. Below is a painting from the period showing what the main market place of the city was like. When the Soviet Union was formed the Novorgord republic was described by Marxist doctrine as feudalism and as such "slaves" to the state. Who brags that he can bring to their land a sweet bird of happiness. The merchants in the market place mock him and say there is no such thing. Sadko decides to prove them wrong and sets off on a quest that is the basis of this adventure film, That won the "Silver Lion" prize at the 1953 Venice Film Festival. Although the United States version of this Russian Fairy Tale motion picture would not come out until 1962. The picture played in other countries. Here is an English language ad for a showing of "Sadko" in Burma, now Myanmar, during 1954. The Corman re-edit while retaining the basic plot of "Sadko" made several changes. One was the removal of all Russian Songs and Dances. This helped to lower the running time from 85 to 79 minutes in length. It was felt that traditional Russian music and dancing might distract from the "Cold War" image of the Soviet Union. A voice over narration is once more added to move the new story along and "Sadko" now becomes the popular "Sinbad". Although it was now five years since Ray Harryhausen's "The 7th Voyage of Sinbad". Television was replaying on children's cartoon programs the 1936 "Popeye the Sailor Meets Sinbad the Sailor:. Which for the first time for young audiences could be seen in color. While a syndicated television series "The Million Dollar Theater" had recently shown Douglas Fairbanks, Jr. and Maureen O'Hara in 1947's "Sinbad the Sailor". So the timing for Roger Corman to release a new "Sinbad the Sailor" motion picture was right even if the actual movie was originally made 10 years before. Corman as with the "Sword and the Dragon" removed all Russian character names and renamed "Novogord" as "Copasand". The script adviser on this re-edit was a young man named Francis Ford Coppola and the screenplay had a more "campier" tone than the original. Returning to "Mystery Science Theater 3000" "The Magic Voyage of Sinbad" did get their treatment. However, Kevin Murphy who was the voice of Tom Servo stated that he had a "love" for the "breath taking style" of director Alekandr Ptushko and had seen all the original Russian versions of the films they were attacking on the program. This East German/Polish co-production was based upon the first science fiction novel written by Polish author Stanislaw Lem "Astronauci (The Astronauts) in 1951. The novel is set in a future Communist Utopian world. It is believed that the Earth is to be invaded by a warlike race from Venus and a space ship of our own is sent there. What they find is a planet now dead from nuclear civil war. Something that will not occur in Lem's Communist Utopian Earth. Over the years Gene Roddenberry received credit for making the 1966 "Star Trek" the first racially integrated television, or motion picture with every one as equals. Some of those claims about the program are incorrect, One of those claims I spoke of in my article on Early television Science Fiction programs at the link below. A second contradiction, without really taking away from Roddenberry, would come from the motion picture "Silent Star" in 1960 based upon Stanislaw Lem's novel. The international flavor of the cast is a nice touch, predating STAR TREK by several years. (The credits even list the cast according to nationality rather than name: e.g., “Kurt Rackelmann as the Indian Mathematician”). Nevertheless, there is a condescending pro-communist attitude: it’s clear that the Soviets have been to the moon first, and they graciously allow an American, Dr. Hawling (Oldrich Lukes) on board their rocket to Venus, even while occasionally guilt tripping him about his country’s use of the atomic bomb against Japan. And the fact that one of the sacrificial lambs is the ship’s sole African astronaut [Julius Ongewe] plays like a bad joke: we may all be brothers in THE SILENT STAR’’s Iron Curtain ideology , but the “brother” is left behind. At least “The Chinese Linguist” (Tang Hua-Ta) – who is a biologist on the side! – learns that his experiments have uncovered life on Venus, before he meets his fate. This latter bit is one of THE SILENT STAR’s few truly affecting moments, capturing both the triumph and tragedy of the mission. Too often, the attempt at a seriousitude yields humorless tone that becomes unintentionally funny. Attempting dramatic, low-key performances, the actors shrug, shakes their heads, and mumble “bah!” as if nothing more important has happened than a light bulb burning out – all while their characters are on a mission to make first contact with an alien culture! This last element ties in with the film’s anti-nuclear message, which is delivered with all the subtlety of an H-bomb. As if the presence of an American scientist who worked on the Manhattan Project is not enough, Tani’s “Japanese Doctor” functions to remind us about the fall-out from Hawling’s work: when observing the shadows of bomb victims etched on Venusian walls by a nuclear blast, she says out loud what we should have been allowed to guess: that the scene reminds her of the aftermath of Hiroshima. In October 31, 1962 Crown International released a re-edited "Silent Star" as the "First Spaceship on Venus". The first difference was the running time. 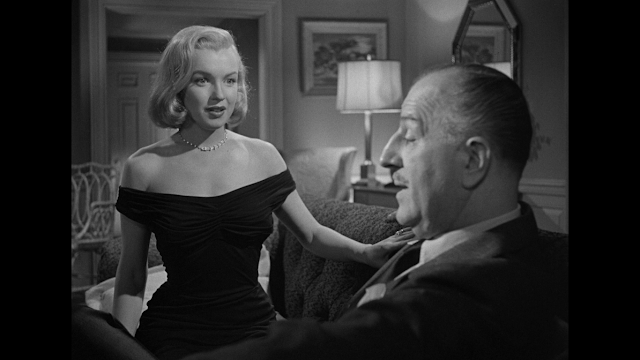 The original film ran 93 minutes and the re-edit only 79 minutes. All references to the bombing of Hiroshima had been removed. Six years after "Godzilla, King of the Monsters" and sixteen years after the end of World War 2. The Atomic bombings of both Hiroshima and Nagasaki were still a touchy situation in the United States. Especially with our now growing trade relations with Japan. Then there were the name changes. Although there was both a Russian and an American on the spacecraft in "First Spaceship on Venus". They were not the same one's as in "Silent Star". For some weird reasoning the Russian and American switched places. In "Silent Star" the Russian was named Arseniev in "First Space Ship on Venus" he became an American named Herringway. While the American character in "Silent Star" Hawling became a Russian named Orloff. Then the Polish character of Soltyk in "Silent Star" was turned into the Frenchman "Durand". The German Pilot Robert in "Silent Star" is now another American named Raimund Brinkman. While the Chinese linguist is called Dr. Chen Yu in "Silent Star", but Lao Tsu in "First Spaceship on Venus".Yoko Tani finds her character referred to as "the Japanese female doctor" in "Silent Star", but gets a complete name in "First Spaceship on Venus" as Dr. Sumiko Ogimura M.D. Even the character referred to in the original as "Television Reporter" becomes Joan Moran seen below. CONFUSED? As with the previous American re-edits "First Spaceship on Venus" joined the gang on "The Satellite of Love" on "MST3K". "Silent Star" was made by the East German studio "VEB DEFA" in conjunction with the Polish studio "Gruppe Iluzjon", "VEB DEFA" would make two other science fiction films "Eolomea" and "In the Dust of Stars". Both films are outstanding. For my fifth and final film I take a look once more at the work of Alekandr Ptushko. With the two previous films by Ptushko while the hero and story may change. They are both connected by Epic Poems from Russia's history/mythology. This film is based on an Epic Poem not from Russia, but Finnish mythology. It is the Finnish National Epic the "Kalavela" which played a prominent part in creating the Finnish National Identity. More about this poem below. So what is the "Sampo" of the original film's title? It is the name of a magical mill that instead of turning wheat into grain. It turns out riches and prosperity and having one is the dream of the hard working, but poor people of Kalevala. There is one person who would be able to make the Sampo and that is the village blacksmith Ilmariren. However, he will not build the mill until his sister Annikki has fallen in love. Annikki falls in love with one of the film's heroes Lemminkainen, but before the Sampo is built. The evil witch Louhi takes Annikki hostage and brings her captive across the sea to the evil land of Pohjola, For the release of Annikki Louhi demands that her brother make a Sampo for her, Lemminkamen leaves to save his love and later joins with the village elder Vainamionen to save all of Kalevala from Louhi. The motion picture "Sampo" was released in Finland and Russia on October 16, 1959. Although in the motion picture Ilmariren is presented just as the village blacksmith. In actuality he is one of the main Finish Gods and is considered the inventor of the "Kalevala" poem, While the witch Louhi is the Queen of Pohjola. The country of Pohjola is believed by scholars to be either parts of Lapland, or a part of Scandinavia known as Kvenland. The point once more is how important to the Finish people is the story of the Sampo and the original motion picture as filmed. Alekandr Ptushko's motion picture would be released in the United States in April 1964 with the very ominous title "The Day the Earth Froze". First question my readers might have is what is "The Day the Earth Froze"? In revenge for Lemminkamen stealing the Sampo the witch Louhi has forced Ilmariren to make, The witch steals the sun that shines above Kalevala and hides it in a cave. The people find themselves in total darkness and without a sun everything is freezing over. As this was supposed to be a children's movie in the United States. Some major changes were made reducing the original film by 24 minutes, The reduced the running time from 91 to 67 minutes. I will explain the reason for the loss of the this time in a moment. Other changes included the opening titles and credits. The director was no longer Alekandr Ptushko, but Gregg Sebelious, the actor playing Lemminkamen went from his real name of Andris Oshin to Jon Powers and the actress playing Anniki went from Eve Kivi to Nina Anderson. As to that reduction in running time. There are two sequences that although faithful to the original Finnish Epic Poem concerning the central character of Lemminkamen were removed. The reasoning at the time had to do with the religious beliefs in the United States and a film company not wanting to stir up controversy. It was similar to the same problem faced by director Robert Weiss 13 years earlier with the picture "The Day the Earth Stood Still". Weiss had to reword the scene of Klaatu being brought back to life to make sure it clearly stated this was by mechanical means, for a short time period, and not a parable of the rising of Jesus Christ. Even though that movie was an allegorical tale of his second coming. The first sequence shows Lemminkamen confronting both the witch Louhi and her trolls and then being escorted by his captures to see the Sampo. As he stands looking at the mill Louhi has a serpent bite him and he dies, The witch throws his body into the sea. The second sequence has his mother searching for her son and speaking to a birch tree, to the mountain path and the sun itself. She learns information and then confronts the witch Loui after walking across the sea to the witches country. After learning the truth about the death of her son. Lemminkamen's mother asks the God's for help and his body is washed on shore. His mother carries her son's body back to Kalevala. Where she rubs his native soil on his lips, adds some sap from the birch tree and when the sun shines upon the body Lemminkamen returns to life. The shorter English language film has the witch throw Lemminkamen into the water and it appears he has swam the entire sea, A quick cut and changed dialogue accomplish this feat. Otherwise the entire story is intact, but not as if its happening in Finland. All five of these motion pictures illustrate in some ways the subtle changes that were been made daily to motion pictures from other countries at the time to reflect both the supposed morality of the United States and the illusion of the "Cold War" that the Russian people were also our enemy. This article is not meant to be political, but just to illustrate how the motion picture industry had to confirm to the policies of the period. I would return to Godzilla once more and Roger Corman. 21 years after "The Day the Earth Froze" was released. The company that Corman had just sold New World Pictures released "Godzilla 1985". To make that movie "acceptable" to the United States still under the "Cold War" concepts started when I was about four months old in January 1947. The Toho Studio's 1984 movie "Gojira" was re-edited and American footage added with Raymond Burr now a retired reporter known as Steven Martin. The entire sequence about an accidental launch of a Russian missile on Japan caused indirectly by Gojira in the original Toho picture. Had to be changed by New World Pictures to a deliberate act by a Russian naval officer. An officer who in the Japanese original attempts to stop the missile and is killed by Gojira when his ship explodes. Also fitting the mold the original Toho film ran 103 minutes and the New World Pictures re-edit with all that additional Raymond Burr footage ran 12 minutes less. Again asking what American audiences were missing out on seeing?